These probes are designed for measurement of magnetic susceptibility and electric conductivity of rocks along borehole profile. 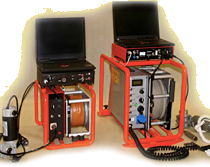 High stability and exceptionally wide dynamic range are giving you a possibility to carry out precise measurements of magnetic susceptibility and conductivity from layers of clay to strongly magnetic and conductive sulphytic and magnetic rocks. Thanks to the induction method applied the probes can be used in water filled, dry and plastic cased boreholes. The probe response is practically instantaneous (<0.5s). Supply Voltage Polarity + on central cond. Probes of diameters 32 and 38 mm can also be manufactured upon special order. Their measuring parameters are similar to those stated above.